STE. MERE EGLISE, FRANCE (S&S) --- American paratroopers and citizens of nearby towns in Normandy gathered here Wednesday to watch U.S. 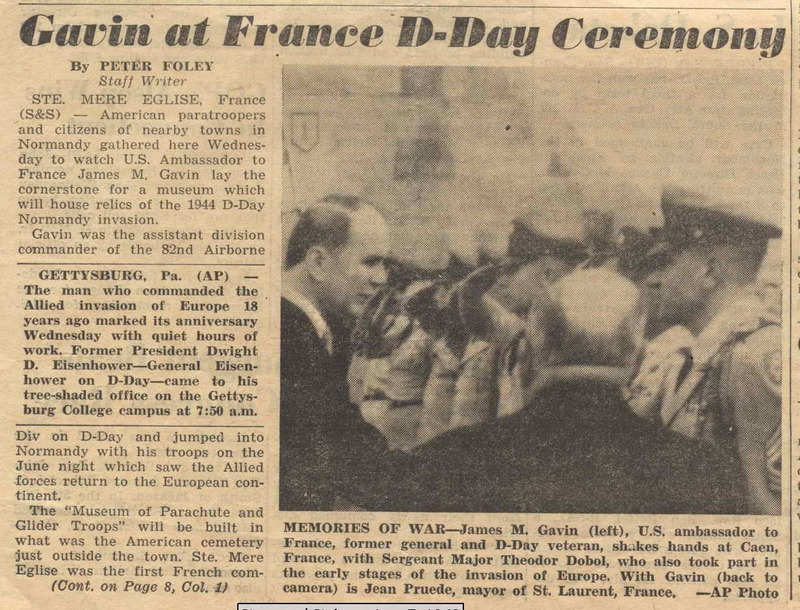 Ambassador to France, James M. Gavin lay the cornerstone for a museum which will house relics of the 1944 D-Day invasion. GETTYSBURG, PA. (AP) --- The man who commanded the Allied invasion of Europe 18 years ago marked ita anniversary with quiet hours of work. Former President Dwight D. Eisenhower --- General Eisenhower on D-Day --- came to his tree-shaded office on the Gettysburg College campus at 7:50 a.m.
Normandy with his troops on the June night which saw the Allied forces return to the European continent.